I am excited to announce the recipients of our first President’s Scholarship competition! Peirce students with fewer than 15 Peirce College credits who are seeking their bachelor’s degree were eligible to compete and winners were recognized at a reception on March 1, hosted by Peirce President Jim Mergiotti. You might remember that we used to offer scholarships specific to your course of study. Since we’ve been busy adding new degree programs, we decided to simplify things by combining our existing program-specific scholarships into a single competition that includes all majors. We offer just as many scholarships and just as much money as before, it’s just not broken out by program. No matter what your major, check out our many scholarship opportunities to see if you’re eligible! Before I get to the winners, I want to give a special thank you to the volunteers who served on the interview committee, along with the efforts of Paul Ballentine, Brian Finnegan, and Heather DeRitis who played a large part in organizing the competition. Christine Bergmark, Melissa Marchena, Tammy Morrison, Tasha Vazquez, Khadejah Alexander, Dana Stancil, Danielle Sandor, Rose Larbi–Morgan, Poitier Jackson, Samantha Minnig, Nicky Cuesta, Amanda Gilbert, Yolanda Wilson, Nataly Nguyen, Breanna Perry, Sam White, Sandra Cusano, Ryan McCellan, and LaToya Smith. 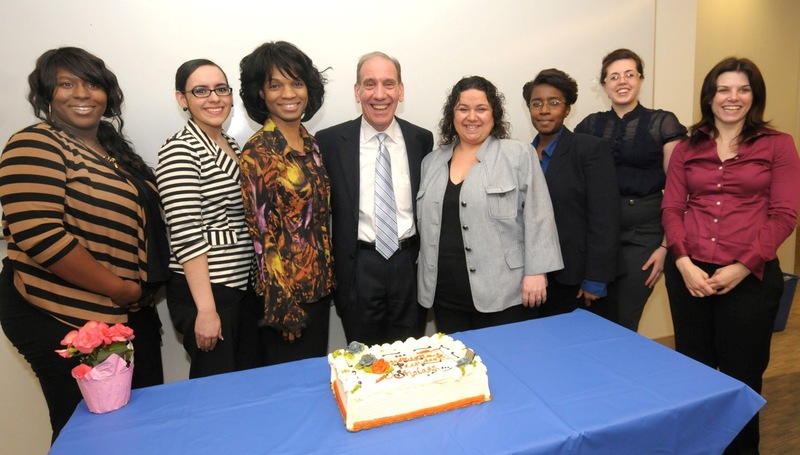 Left to right, winners LaToya Smith, Tasha Vazquez, Rose Larbi-Morgan, Nicky Cuesta, Dana Stancil, Breanna Perry, and Melissa Marchena pose with Peirce President Jim Mergiotti (center). Congratulations and best of luck to our inaugural President’s Scholarship recipients as you work towards your academic goals!